Simple As That Natural Sunscreen For Children has been pharmacist formulated to safely provide broad spectrum protection from the suns UVA and UVB rays using Zinc Oxide as its active ingredient. 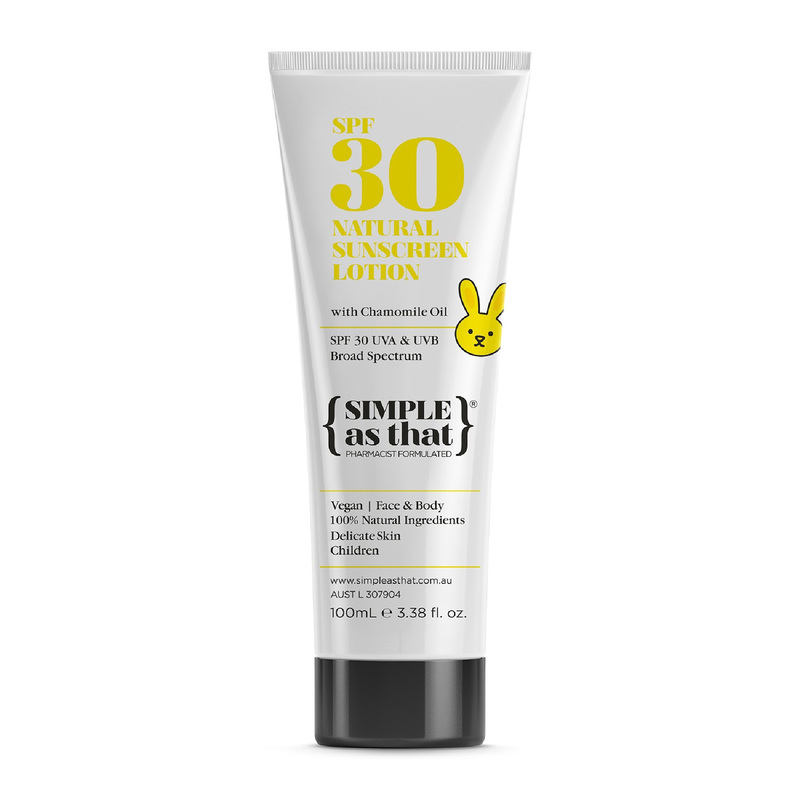 Simple As That Natural Sunscreen For Children has been pharmacist formulated to safely provide broad spectrum protection from the suns UVA and UVB rays using Zinc Oxide as its active ingredient. The lotion also contains Green Tea and Rosehip Oil, well known for their antioxidant properties, as well as their signature ingredient, Chamomile oil, to gently nourish and protect children’s delicate skin. The Simple As That Natural Sunscreen For Children is a light-weight mineral, natural sunscreen that is pure vegan friendly, non-greasy and, preservative free perfect for both face and body and able to protect the whole family. We recommend babies should be sheltered from the sun as much as possible. However if this isn’t possible, our Children’s sunscreen has been formulated to be safe enough to use on delicate and sensitive skin. As with any product, we recommend you do a patch test on a small area of skin before general use. Apply liberally onto clean, dry skin and rub in evenly twenty minutes prior to sun exposure. Apply enough to give a visible layer before rubbing in. Re-apply every one to two hours and after swimming, exercise, excessive perspiration or towel drying.